First Insight revealed the first in a series of reports looking at how discounting in department stores and mass merchandisers influences the expectations for discounts in other product areas including home electronics, home appliances, furniture, smartphones and vehicles. 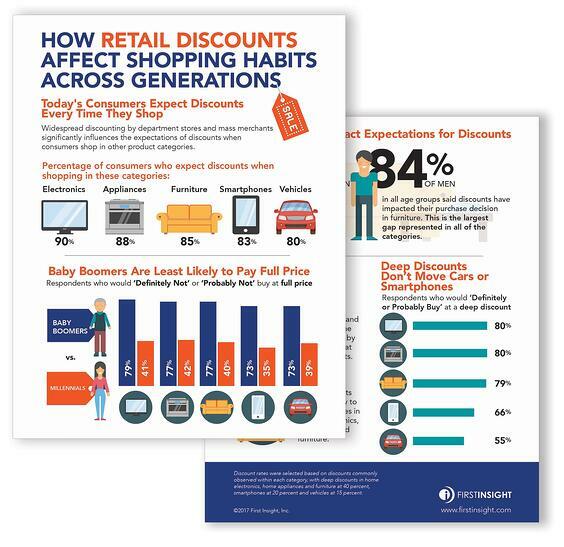 Nearly 80% of the respondents said that it is significantly or somewhat influencing expectations for discounts in other areas, with Boomers expecting deeper discounts than Millennials and Gen-Xers in all categories. Download the infographic to learn more.